A quickie analysis during lunch. That spells the end of the temporary rebound from 1,601.5 low (Jan22) to 1,638 high (Feb04). 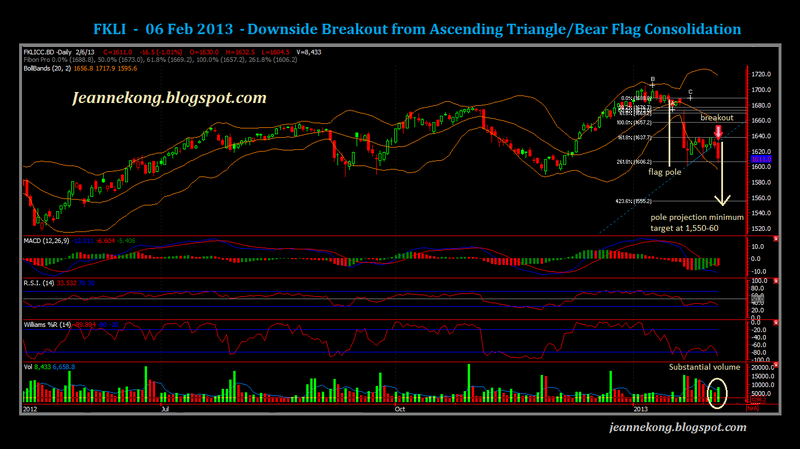 The triangle breakout minimum target of 20pts is achieved as price dropped from 1,630-1,604.5 morning session low. We are seeing bears taking a breather now, with price consolidating within 1,605-1615 range as of close for midday break. For the day, we may well see price recover back to about 1,615-25 on technical rebound. Whether or not the day will end with a new low remains to be seen. On the mid-term though, FKLI is firmly bearish as today's breakout signal continuation to previous downtrend from 1,705 all-time high. Previous consolidation may be considered as a BEAR FLAG, which then gives a mid-term downside target of 1,560, which is also a 2.618 fibo projection target from 1,705 peak. Today saw FKLI tested the long-term support of 1,587 & rebounded all the way back to close at 1,611, after hitting an intraday high of 1,615. My Feb 06 analysis is basically still intact. We might see price recover a little further from here, with the help of some short-covering activities before the CNY long holidays. 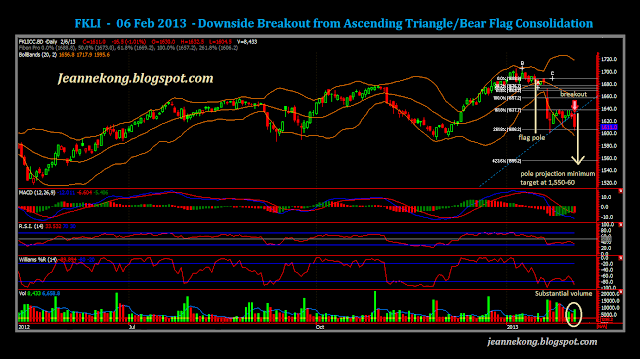 Watch for rebound high of 1,615-25, which may add to another lower high on the daily downtrend. Level of 1,625 may proved a strong resistance, separating a strong rebound (if able to break above it), from a weak bear rally (price hindered by it). Expect tmr to see a small-bodied candle with upper shadow testing the resistance levels mentioned. Volume may lighten ahead of the long holiday.